Recently we posted a rundown of the 10 largest diamonds in the world. You might think that the 10 largest diamonds would also be the 12 most expensive ones, but that’s actually not the case. Carat (which actually refers to weight, not size) is just one of the four Cs—the criteria that determine the value of a diamond. The others include cut, clarity, and color. Some of the most expensive diamonds in the world are smaller, but they stand out in some other way. Some of these diamonds have incredible clarity, while others are a rare and unique color (often pink). Let’s start with the 12th most expensive diamond and work our way up to the world’s most expensive! This diamond weighs 76.02 carats, and set a record in November of 2012 at an auction where it was sold for $21.4 million. That was a record for the most expensive colorless diamond per carat ever to be sold at any auction. The beautiful white gemstone was mined in India and then cut in the cushion shape. It was named for Archduke Joseph August of Austria. This diamond features a rectangular cut which really showcases the clarity of the diamond and its vivid pink hue. It was mined in India, and weighs in at 14.23 carats. This is a great example of a smaller diamond (compared to others on this list) that still nets a big price because of its color. The diamond was sold in 2010 by Christie’s Hong Kong, which reported that it was actually one of the largest pink diamonds it ever sold. In 244 years, the auction house has only sold 18 pink diamonds that weighed more than 10 carats. Here is another beautiful pink diamond featuring a cushion cut and discovered in the Golconda mines in India. It weighs around 34.65 carats, and was found three centuries ago. Christie’s auctioned it off in April of 2013, when it sold for $39.3 million dollars. It is believed to be the third largest pink diamond ever discovered, following the 60-carat Noor-ol-Ain and the 175-carat Darya-ye-Noor—both cut from one original diamond—and the Pink Star, which weighs 59.60 carats. The Graff Pink Diamond – Image courtesy of Sotheby’s. The Graff Pink weighs 24.78 carats, and is classified by the Gemological Institute of America (GIA) as “fancy intense pink.” The history of the diamond is murky at best, but it went for auction in 2010. 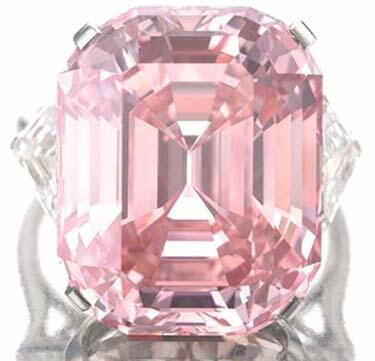 The pre-sale estimate of the Graff Pink’s value was $27 million. It sold for an astounding $46 million. At the time, the diamond had a different name. It was renamed by its buyer, Laurence Graff of Graff Diamonds, who of course named it in his own honor. This deep-blue diamond features a vivid, intense color and startling clarity. It was purchased by the same Laurence Graff in 2008 for £16.4 million. Once he had it, he had it re-cut to remove some of its flaws. This reduced its weight by 4 carats, and was a controversial move since the diamond at this point became unrecognizable. Since the diamond has a rich historic history, this was seen as a questionable move. Nonetheless, this move greatly impacted its value in a positive way. The GIA regarded the gem from “fancy deep grayish-blue” to “fancy deep blue,” putting it in the same class as the Hope Diamond. Instead of being rated at “very slightly included” as it was before, it is now rated as “internally flawless.” Its value has gone up as well, now estimated at around $80 million. Here is yet another beautiful pink diamond, formally known as the Steinmetz Pink. This diamond weighs an impressive 59.60 carats, and is rated by the GIA as “fancy vivid pink.” It was discovered in South Africa by De Beers in 1999, and is the largest diamond in the world that currently merits the “fancy vivid pink” rating. The Pink Star changed hands in 2007, but the buyer and price were undisclosed. It was auctioned off again in 2013 in Sotheby’s in Geneva for $83.19 million. As of yet, the buyer still has not paid the price for the purchase, and right now, the stone is a part of Sotheby’s inventory. For that reason, $83.19 million is an estimated value only. The De Beers Centenary Diamond is among the most famous diamonds in the world, discovered in the Premier Mine. It weighs in at an astounding 273.85 carats. The GIA rates it as a D-grade colorless diamond which is internally and externally flawless. It has never been publicly appraised, but it is estimated to be worth at least $90 million, and it was insured to the tune of $100 million when it was unveiled in 1991. The diamond was displayed in the Tower of London for some time, and it is now believed that someone other than De Beers is its owner. De Beers has refused to comment on the current ownership of this majestic gem. This beautiful pear-shaped diamond is the property of De Beers, and is rated as the second largest Grade 2 Colorless diamond on the planet. Unearthed in 1990 from Zaire, it was originally 777 carats before it was cut. The stone has been insured for £100 million, hinting at its great value. The Cullinan II, also known as the Lesser Star of Africa, is one of nine diamonds which were cut from a single tremendous stone discovered in the Premier Diamond Mine in South Africa in 1905. It was the biggest gem-quality diamond ever found: an astounding 3,106.75 carats! Originally it was discarded by a manager who couldn’t bring himself to believe that such a large gemstone could actually be a diamond! Assuming it was something less precious, like quartz, he let it go. Imagine how he felt when it was recovered later and he realized how much value had slipped through his fingers. In 1907, this stone, called the Cullinan, was given to King Edward VII. It was then cut into nine different gemstones, which were added to the United Kingdom’s Crown Jewels. At the Queen’s Diamond Jubilee at the Buckingham Palace in 2012, seven of the nine Cullinan jewels were displayed. Just think what a dazzling display that must have been to witness. The Hope Diamond is arguably the most famous diamond in the world, so it is not too surprising that it is also among the most valuable. 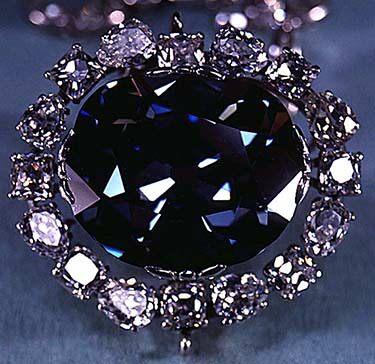 Weighing 45.52 carats, the Hope Diamond is renowned both for its deep blue color and its colorful history. According to legend, the Hope Diamond brought misfortune on its many owners. It is currently on display in the Smithsonian Museum in Washington D.C., where museum workers say it has brought nothing but luck. If you were impressed by the Hope Diamond’s hefty price tag, you will be even more blown away by the estimated $400 million value of the Cullinan. When this gemstone was discovered in Sir Thomas Cullinan’s South African mine in 1905, it was the biggest rough cut diamond ever found: an astounding 3,106.75 carats! Originally it was discarded by a manager who couldn’t bring himself to believe that such a large gemstone could actually be a diamond! Assuming it was something less precious, like quartz, he let it go. Imagine how he felt when it was recovered later and he realized how much value had slipped through his fingers. In 1907, it was given to King Edward VII. It was then cut into nine different gemstones, which were added to the United Kingdom’s Crown Jewels. The Cullinan is the most valuable of these nine jewels, but the rest are quite famous as well, including the 530 carat Great Star of Africa. At the Queen’s Diamond Jubilee at the Buckingham Palace in 2012, seven of the nine jewels were displayed. Just think what a dazzling display that must have been to witness. The Koh-i-Noor is perhaps every bit as famous as the Hope Diamond, and is considered one of the most unique and historical diamonds in the world. The diamond had never actually been sold in all of its long, storied history. It has been gifted, traded, or stolen every time it has changed hands. For that reason, it is challenging to estimate its financial worth. Because of its rich history though, it is widely considered to be priceless. It is one of the Crown Jewels, which are valued in total at around $10 or 12 billion. This at least gives some idea to its potential value on the market. Now you know 10 of the most valuable diamonds in the world! But as the Koh-i-Noor reminds us, sometimes the value of a diamond is immeasurable. While all of these monetary estimates are only that—estimates—in a sense, any monetary value is an estimate only of true value. The true value of a diamond can never be quantified. The beauty and history of each of these gemstones has infinite value!